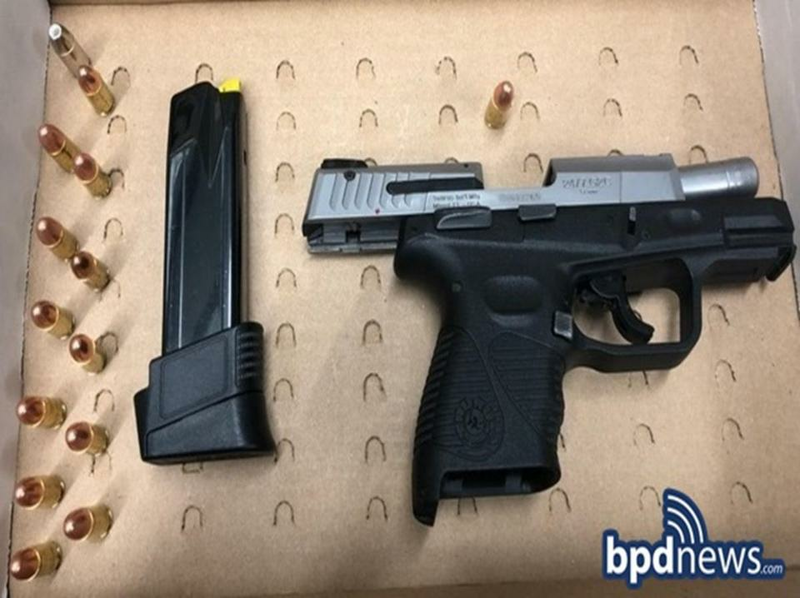 A reputed gang member on probation for a gun crime was allegedly caught Wednesday with a loaded firearm in Dorchester and taunted arresting Boston police officers about the 2015 shooting of one of their own, court records show. The suspect, Davell J. Woodrum, 25, was described in court documents as a known associate of the H-Block street gang. He led police on a brief foot chase Wednesday evening while possessing a firearm, and he had sharp words for his captors as he waited to be transferred to a district station for booking, an incident report said. In that March 2015 case, Officer John Moynihan was shot in the face during a traffic stop by Angelo West, a gang member with a long rap sheet. Police returned fire, killing West. Moynihan survived and has returned to active duty. On Wednesday night, another traffic stop brought Woodrum into contact with officers from the Boston police Youth Violence Strike Force. Police learned Woodrum, on probation for a firearm conviction, was in possession of a gun, which he’s barred from having because of his record, the report said. So they kept an eye on Woodrum’s Cheney Street residence and saw him getting into the back seat of an idling car outside the home around 7:25 p.m., records show. Police stopped the vehicle on Blue Hill Avenue after it darted across two lanes of traffic without signaling, the report said, and Woodrum bolted from the car. Police gave chase, catching up with him at the main entrance to the Grove Hall Mecca shopping center. Officers seized a firearm from the right pocket of the basketball shorts Woodrum was wearing underneath his sweats, according to the report. The .9-millimeter gun had one round in the chamber and 13 live rounds in a large-capacity feeding device, police said. Woodrum was arraigned Thursday in Dorchester Municipal Court on several gun-related charges, including being a firearm violator with two prior convictions for violent or serious drug crimes, records show. He faces 10 to 15 years in state prison if convicted on that count. A not-guilty plea was entered for Woodrum, who was ordered held on $100,000 bail, according to legal filings. His lawyer couldn’t be reached for comment. Woodrum has prior arrests on a host of charges including armed carjacking, attempted murder, kidnapping, armed robbery, assault with a dangerous weapon, assault and battery, and destruction of property, records show. It wasn’t clear how many of his prior charges have led to convictions. During one incident in 2013, Woodrum put a gun to his ex-girlfriend’s head and struck and choked her repeatedly, records show. Woodrum told police the gun didn’t work, and he told someone in a phone conversation at booking that because the firearm wasn’t functional “he would be smooth on that,” an incident report said. He was charged with multiple crimes in that case including assault by means of a dangerous weapon, records show. He was sentenced in that matter to two and a half to three years in prison, followed by four years of probation, officials said. In the new gun case stemming from Wednesday’s arrest, Woodrum’s next hearing is scheduled for Feb. 11.